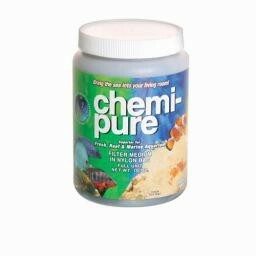 Aquaria BE CHEMI PURE 1O0Z - Rick's Pet Stores Inc.
Chemi-Pure is the original ion filter medium improved over the years that removes harmful waste products and toxins from your aquarium water. It has been tested and proven to help fish live 4-5 times longer than in any other closed system (freshwater and marine). 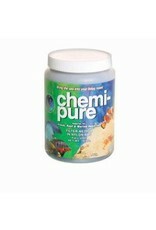 Chemi-Pure makes it easier to maintain crystal clear water, contant pH, and lower ammonia and nitrate levels. Dramatically reduces the need for water changes. Suitable for aquariums up to 40 gallons in size. Use as directed.